Since everyone else is going “OMG, this person said THIS about Sonic 4” I thought we’d jump on the bandwaggon but instead of prattling on about people you don’t know actually tell you about the opinions of someone that, you know, you might actually give a damn about. So we present you with details of Ready Up‘s preview of things from “SEGA Unfold” an event I was at on Wednesday/Thursday last week with Iizuka-san and a bunch of others. 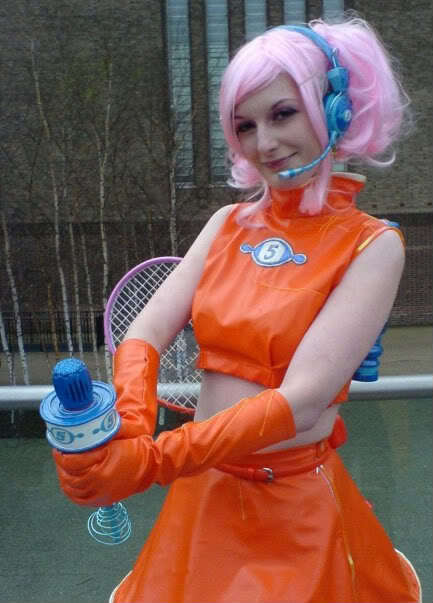 Anyway Ready Up are one of “my guys” from a SEGA community team standpoint, who somehow managed to get past me and get invited to the Press Event – what you probably don’t know is that they have on their staff Fran Shergold you may recognise as Ulala from Space Channel 5 or alternatively “that really hot one dressed as Ulala from Space Channel 5” (as overheard) depending on your blood temperature who was at Summer Of Sonic (actually she’s been to all three I think) anyway she’s a friend of the site. . In fact she was hotter at SOS than you probably think in all that vinyl. So Fran and Duncan also from Ready Up came up to me and said hello, of course I didn’t twig first of all it was her… then again I wasn’t expecting to see her. Anyway she was rather pleased with Sonic 4. She also had a go on a lot more that that, find out her thoughts on things like Colours, Free Riders, Vanquish and VT4 here.